15.5" x 12.25" x 12.25"
20" x 13" x 13"
Spring greetings! Many of you said that you enjoyed my writing a little piece on each of the works that I chose to feature in March. I also enjoy writing about the work as it gives me the feeling of being in front of the piece with you and discussing it. I also enjoy hearing your perspective on the works and look forward to hearing your comments and answering any questions that you may have. This new piece by Preston is quite different than any I’ve seen before. I love the color and the graphics. The form is also elegant. I have not heard from Preston yet as to the story behind this piece but I do know that all of his works are in some way inspired by his native Tlingit tradtition. As we saw in last month’s newsletter, Stephen has recently been creating some pieces that are much smaller than the ones he has made in the past. The simple but elegant form provides a perfect canvas for the beautiful multi-colored murini. Here is another piece from Steven’s new series. I find the use of the twisted cane work in this cast piece to be very fascinating. It is indeed like a "roadmap" and yet does not seem to take us anywhere other than into our own inner space. Along with the "Bilbao" and "Dinosaur" series, the "Angel Tear" has become one of the maestro’s classic series. This one is particularly stunning. This piece is part of Lino’s retrospective exhibition in Venice and is available for purchase along with many other works in that show. Please contact me if you’d like to see other available works from the exhibition. 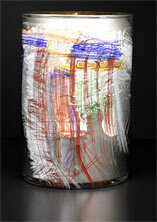 Many Chihuly collectors will be excited to learn that Dale and team have been blowing an all new series of cylinders. These works are blown with a silvering technique Dale has been experimenting with for the past couple of years. Here is an example of one of these cylinders and I have others to share with you if you are interested. Lino’s retrospective exhibition at the Palazzo Franchetti in Venice has attracted visitors from around the world. The exhibition is scheduled to travel to at least one museum in the U.S. and I will keep you posted about the details. An exhibition catalog with texts by Rosa Barovier Mentasti and Tina Oldknow is available by emailing [email protected]. The 168-page hardcover book retails at $50.00 per copy plus shipping and applicable sales tax. 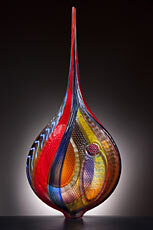 Currently showing at the Boston Museum of Fine Arts is a major one-person exhibition of the works of Dale Chihuly. The exhibition will be up through August 7 and is entitled "Through the Looking Glass." I hope you enjoyed this month’s images and information and look forward to staying in touch with you!